We’d love your help. Let us know what’s wrong with this preview of Overstreet Comic Book Price Guide Volume 43 by Robert M. Overstreet. To ask other readers questions about Overstreet Comic Book Price Guide Volume 43, please sign up. I think the last one I purchased was from around 2004, but I didn't see that one listed so I'm going to give a quasi-review/quasi-Dear-John letter of this one in its place. I've had two of my own guides over the years, keeping each for about a decade. The 2004 one will probably be the last one I every buy. There are inconsistencies and some simply crazy things in every one of these guides, but when it is all said and done it is still THE guide, the most informative information resource, and the I think the last one I purchased was from around 2004, but I didn't see that one listed so I'm going to give a quasi-review/quasi-Dear-John letter of this one in its place. I've had two of my own guides over the years, keeping each for about a decade. The 2004 one will probably be the last one I every buy. There are inconsistencies and some simply crazy things in every one of these guides, but when it is all said and done it is still THE guide, the most informative information resource, and the undeniable wishlist helper. I remember checking one of these out from the library when I was a lad in the first year of high school. Holy Cow, did I ever want to get my hands on all of thousands of old comic books Mr. Overstreet was showing me! No movie guide, coin guide, or toy guide was ever so complete about its subject matter back then. And those covers they showed you on every page...Buck Rogers by Frazetta, Batman by Neal Adams, Prince Namor by Everett, the X-Men by Byrne...it didn't get much better than those glimpses into my chosen hobby. Sadly, the entire market has long since collapsed, never to return, with the majority of the pre-teens who could have been expected to read a comic every now and again now texting hundreds of messages a day or playing X-Box for hours on end. And with fewer readers come higher prices. Comics now range from $2.99 to $3.99 for a single 32-page issue. That's four bucks for a 15 minute read, folks. (Compare that to a perfectly good used paperback I can get for 50 cents at the flea market and enjoy for most of a week's worth of free time. I can also watch movies on youtube until my eyes bleed, for free with free wifi at the business across the street.) And now that Disney owns Marvel, sheesh...isn't Punisher Max inconsistent with the Magic Kingdom?...I feel like even the rare new titles I still like might have an expiration date on them. When I started reading comics they were 35 cents new! While it is possible to still find recent comics for $1 at a convention, I have to say sorry Marvel, sorry DC, and sorry Mr. Overstreet, but I just can't afford this love affair any more. "The Overstreet Comic Book Price Guide" started in 1970 and it is annually published since 1974. This year edition is celebrating Superman's 75th birthday with an original cover by Andy Kubert and X-Men's 50th with an original cover by Mike Deodato, Jr.
As usual it's packed with prices and all other important data for comic collectors and sellers on around 1100 pages for about every comic book ever published in USA. This year around 300 000 comics are listed together with fresh market reports from "The Overstreet Comic Book Price Guide" started in 1970 and it is annually published since 1974. As usual it's packed with prices and all other important data for comic collectors and sellers on around 1100 pages for about every comic book ever published in USA. This year around 300 000 comics are listed together with fresh market reports from Overstreet Advisors, group which includes loyal fans, comic historians and vendors. Due to already mentioned anniversaries, articles about Superman's 75th, the X-Men's 50th and also The Walking Dead's 10th anniversary are included. Of course, edition is also including the latest new entries into The Overstreet Hall of Fame. I received this year's edition in soft cover but it is also available in hardcover version. 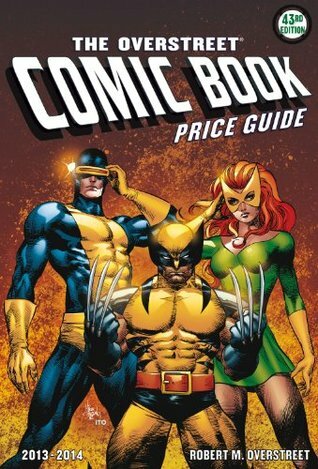 Handy Guide to determine current comic book prices. (Especially) when dealing with online sellers attempting to overprice comics and gouge and take advantage of buyers who do not use a current CBPG. This book does not list CGC prices. Given to Gene Demaitre in 2011.